It has been about six years since I've been to the beach. I'm not exactly what you would call a beach person, and neither is Toni. However, I do enjoy photographing some different scenery from time to time. The opportunity came up to be able to go for a quick little weekend getaway, and instead of our normal mountain excursion, we decided to head to the coast. Just to change things up, we decided to go to the Outer Banks instead of Carolina Beach where we would typically go. The weather was looking pretty decent with moderate temperatures and roughly 40-70% cloud cover for the entire weekend. That would mean very favorable conditions for photography. Since we had to leave after I got off from work on Friday, we got to the beach much too late to do anything except for settle into the room and get ready for the next morning. The weather was still looking promising, if not a little cold in the morning. 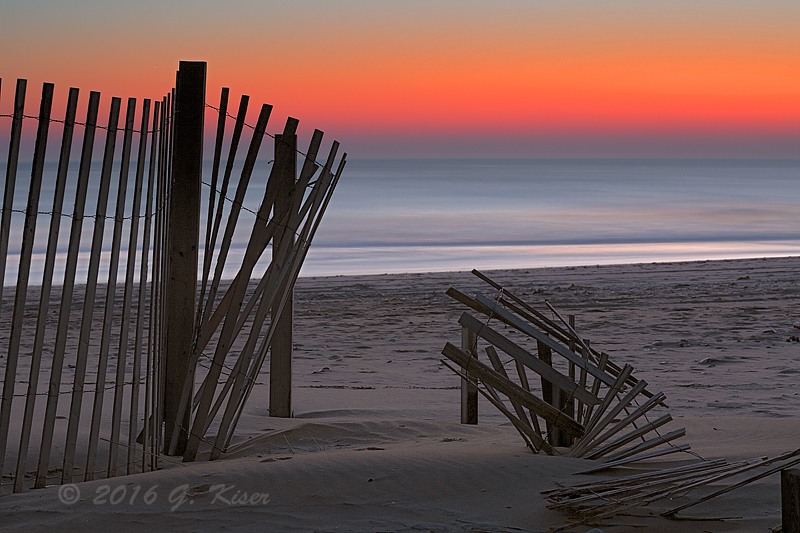 I decided that I would get up about an hour and a half before sunrise, so that I could be out on the beach in plenty of time to find some workable compositions. This is part of the dedication of a photographer, I would have much rather slept in, and enjoyed the sounds of the crashing waves as I woke up. Instead, I had an alarm blaring in my ear. I bundled up best I could with the clothes that I had and headed out for first light. 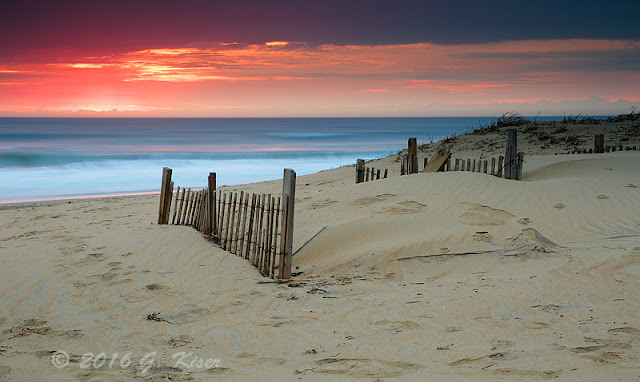 I have always enjoyed working with the fences at the beach, and this particular Nags Head coastline had plenty to work with. 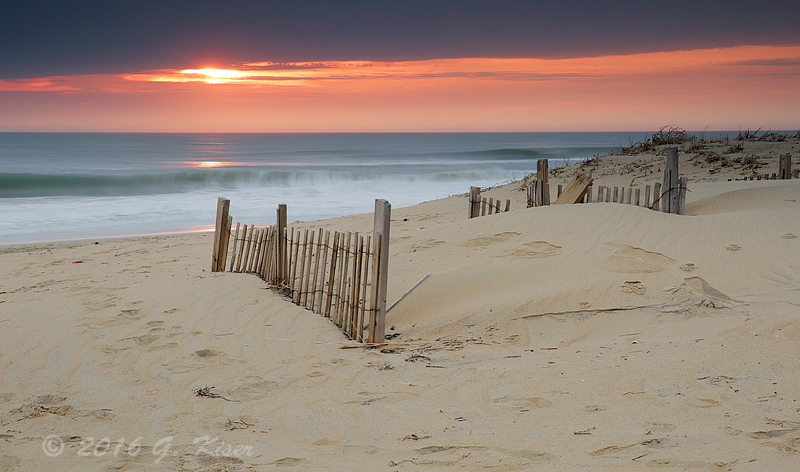 I hunkered down in the sand and framed a shot that took advantage of the pickets and waited. Using my 24-70mm lens with a 3-Stop Reverse ND grad filter, I was able to capture the first hints of light from the sun which was still well below the horizon. I was really hoping for an amazing sunrise since there was a hole in the clouds right where the sun would be peeking out, with thick clouds overhead. I crossed my fingers, but worked with the existing conditions as best I could. As the light started to change, I decided to switch to a better location that was no longer back lit from street lights. I moved over to the right about 100 feet, and set up with a slightly different composition. With the wind gusting to 20mph, I decided it was better not to bother switching lenses, so I kept my original setup on the camera and framed a different composition. I was still using the ever available fences for foreground interest, but the landscape had changed. As the sun continued its trip to the edge of the water, the clouds started to come alive with color. This was going to be it! I don't do a lot of sunrises, and I was starting to think that I was going to get very lucky on this one. Just in case things changed though, I continued to work the conditions as they changed. As it turns out, Outer Banks Reflections is my favorite from this morning, and quite possibly from the entire weekend. It really did come together very nicely, and while the sun wasn't working its magic on the dense clouds above, the reflections in the water make up for it I think. As the sun climbed higher and higher, the clouds never did change color, and they eventually started getting darker. With the sun at the base of the clouds, I realized that I wasn't going to get the sunrise I was hoping for. However, I was getting some great reflections in the water, and the waves were working out nicely for me as well. I don't do sunrises often, but I do enjoy capturing the moments when I can. With the sun's direct involvement in my photographs done, I started to look around for other possibilities that might present themselves. Looking out over the water was no longer all that interesting, so I looked behind me. As it turned out, the thick clouds above me, were actually starting to get rather interesting with the back light from the sun. Fortunately, there were a few really interesting beach houses that caught my eye, and gave me a composition beneath the clouds to work with. As you can see, I really do like my fences! 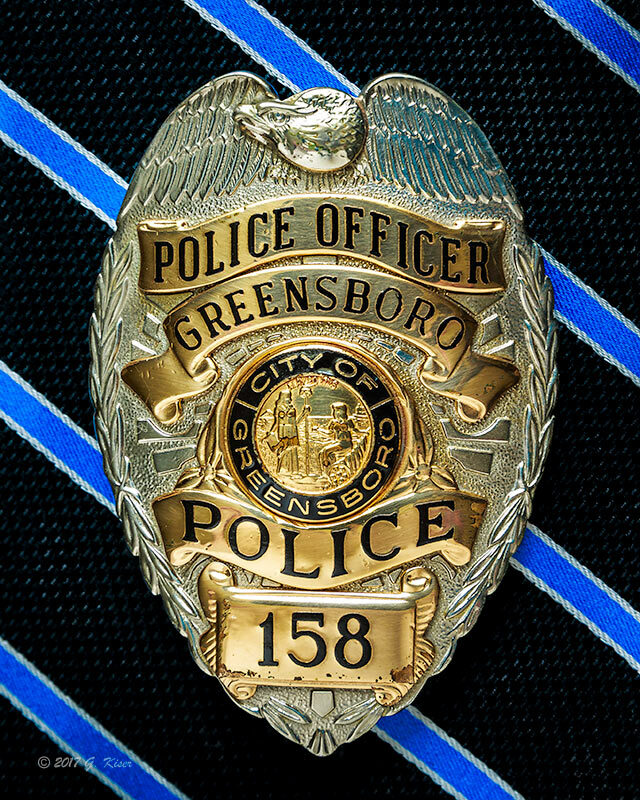 They provide great leading lines, as well as repeating graphical elements. 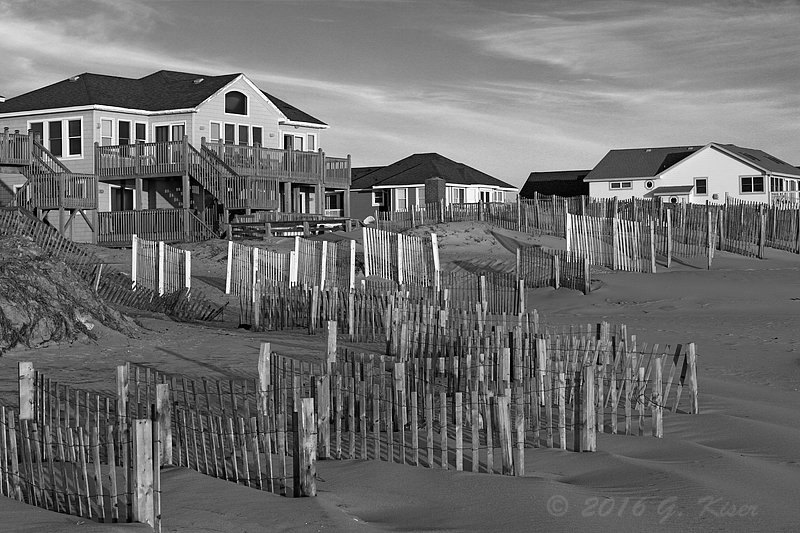 I was able to incorporate them in this composition that highlighted a sand colored house. 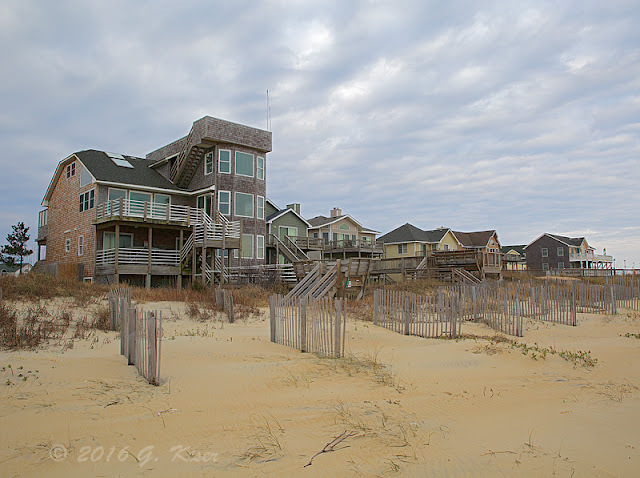 While the yellow typically would just blend in with the sandy surroundings, I felt with the blue tones in the clouds above, and the blue house to the side, I could achieve a very balanced color pallet. To add to the serenity, I had the repeating patters of the fences leading to a bookend that was a wooden walkway to the left. This composition just felt right, and was a natural shot. The clouds were still rather remarkable, so I continued to find beach houses to place beneath them. On the other side of the hotel, I found this unique house that seemed to really stick out from the crowd. With the help of a wide angle composition, I was able to really emphasize that visual weight. The fences again helped me establish where the viewer's eyes should be going. The clouds even decided to make leading lines to the house I was focusing on. Yeah, this one actually composed itself it would seem. 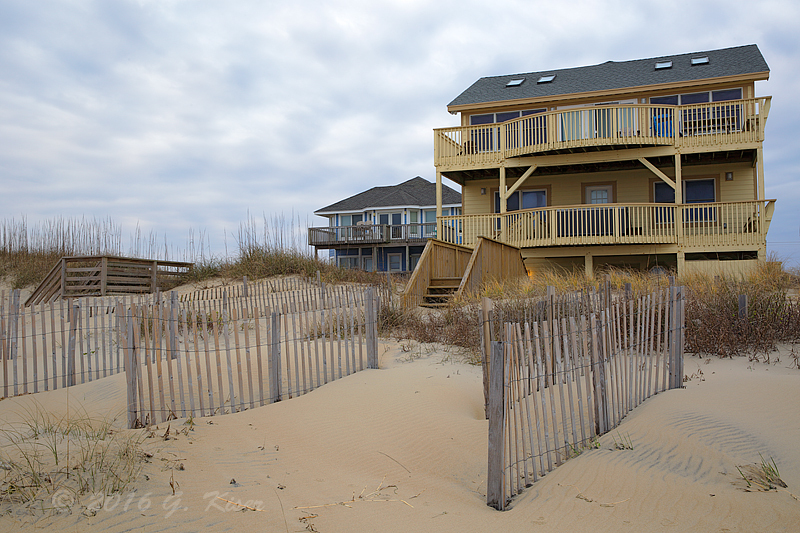 I was having fun with the houses, but I wanted to work some with the dunes as well, so I moved off of the beach and found a nice vantage point for a dune. 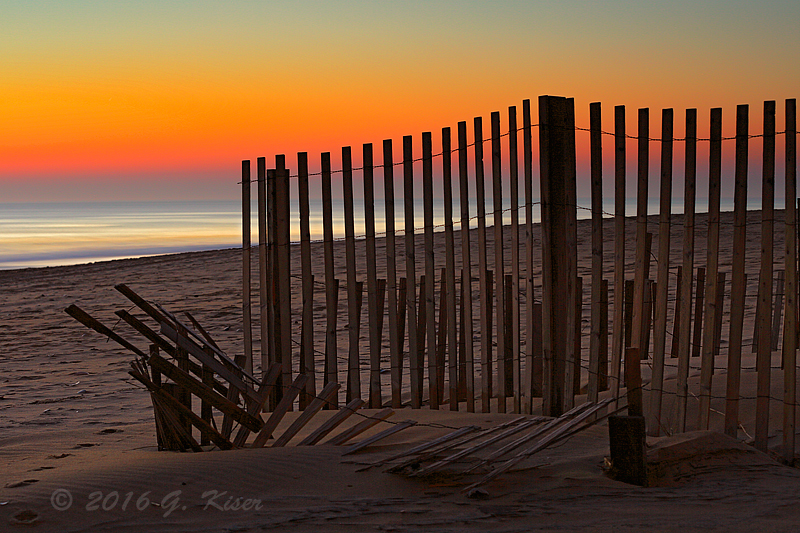 I'm sure this won't come as a shock, but I found a nice fence to go with the dune when I was looking. I had actually spotted this the night before from the balcony of the hotel. I wasn't sure how it would work as a picture, but I saw potential in it. As I was working on the composition for the dune, I realized that I would do better working this from an abstract angle more than a straight up landscape frame of mind. I looked for shapes and textures more that simply subject matter here. The hard lines of the fence played well with the cottony feel of the sky above. 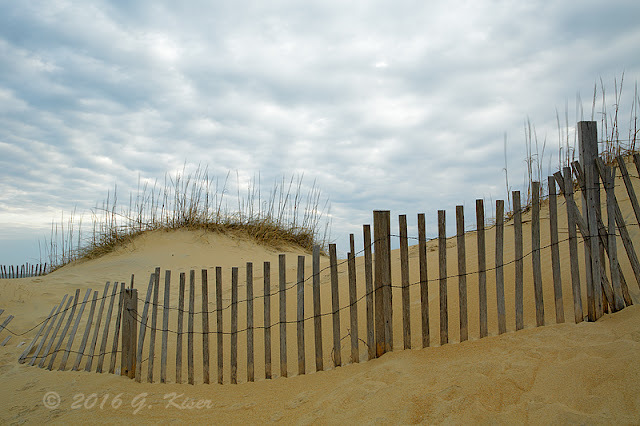 The fence also mimicked the grass atop the dune. The fence dropped where the dune actually rose above, and then the fence balanced itself out on the other side of the frame. For a simple picture, there is just so much going on with it! The funny thing about this is I shot it from the parking lot of the hotel, while talking to one of the guests who was visiting OBX from Virginia. With the conversation over, the picture completed, and Toni back from her morning run, it was time for me to pack it in and go eat breakfast. It was about 8am at this point, and I was getting hungry. After breakfast, Toni and I prepared for our day which would include going out exploring to see what we could see. The clouds that had been so promising in the forecast had decided to become a featureless overcast, so I wasn't thinking too much about photography at this point, but we were going on a road trip anyway. One of the stops that we made was to the Bodie Island Lighthouse. This was one of the primary reasons for the trip to OBX. Toni hasn't seen any of the NC lighthouses and she wanted to rectify that situation. 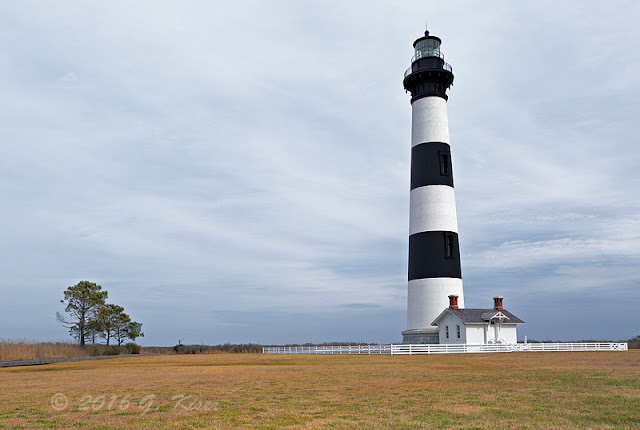 Nags Head was within easy driving range of two different lighthouses. 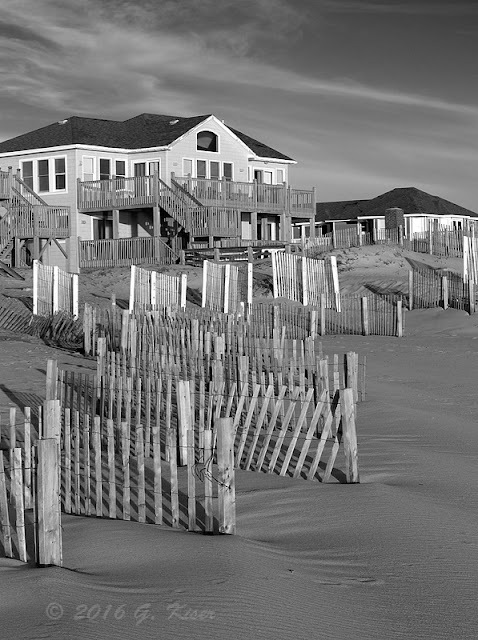 Bodie Island was one, and there was another located in Manteo. On our first pass on each I didn't even get the camera out, we just walked around looked at the landmarks. However, as the day moved along, the sky started to change a bit, and I decided to head back to Bodie Island once again. We got there, and I got the camera put together very quickly, using my 16-35mm lens for the perspective that I wanted. I quickly found a composition using a pair of trees to the left for scale and balance in the frame. The sky was mostly washed out, but there was still some detail left in the clouds, which I exposed for. After two initial shots, I moved to some better compositions, but the clouds had changed up, and the detail was all but lost. The temperature was dropping, and I wasn't seeing much promise in the sky, so we decided to head on back to the room and start thinking about dinner. 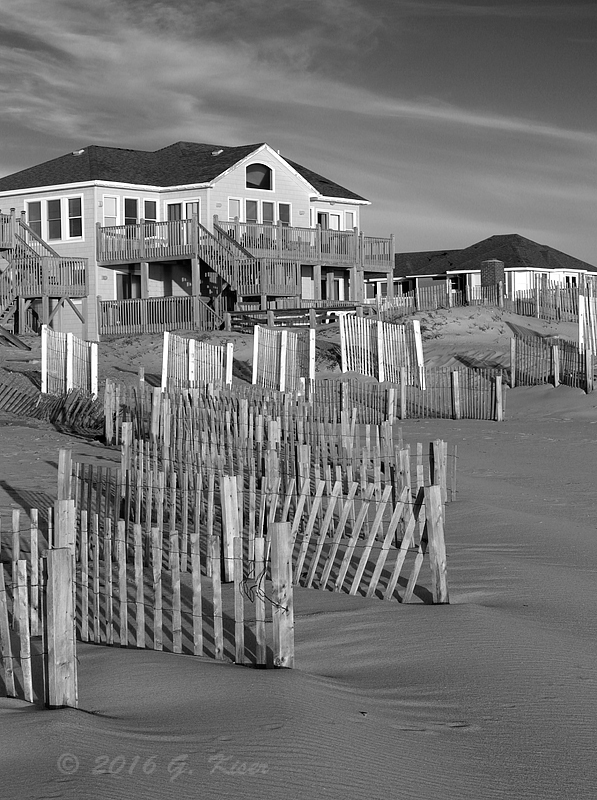 By the way, NOTHING is open on the Outer Banks in the off season, but that is another story, for another time. The day was done photographically. I wasn't sure what I had gotten, or if I had gotten anything at all. Looking back in the camera's LCD wasn't really telling me much since I shoot in a low contrast, low saturation format. Everything just looked blah and washed out. I was hoping that for nearly 70 frames shot, I would have something usable. The next morning started out much the same as Saturday did. I woke up about 5:15 and checked the weather. The hourly forecast was calling for 45% cloud cover, which would be ideal for my purposes. However, looking out of the window of the hotel room, I found very little clouds in the sky. In fact, I saw not a single cloud. I wasn't going to miss out on my last day of coastal photography, so I went out anyway. Knowing that I wouldn't be able to include much of the sky...if any, I chose to fit my 70-200mm lens which would only pick out a small portion of the horizon which would have some color to it. Pulling a trick out of my book from years ago, I really focused in on the fences this time. The idea was to have a strong visual interest in the foreground, and the compressed horizon in the distance would provide intense color in the background even though there was only a sliver of actual color to be seen. Ah, the magic of focal length! 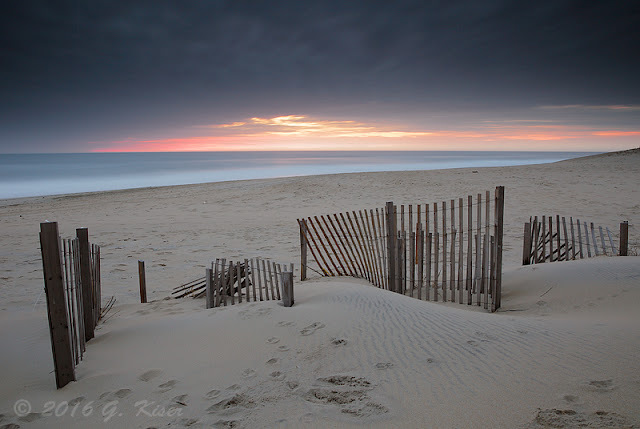 I again used various ND grad filters to control the contrast in the scene and keep the sky from blowing out. These filters have been invaluable over the years for so many of my photographs. Short of the polarizer, the ND grads are the most important accessory I carry in my camera bag. The nice thing about such a long lens is that I can pick out just about anything in the landscape and make that my focal point. I shifted just a few feet to the right for this second picture, but it changed the entire feel and focus of the image. I'm not sure which I like better, but they sure do illustrate how compositions can change dramatically with just a few steps. The fallen fence is present in both pictures, but its role is completely different. Once the sun was up, the little bit of color was gone. I looked above me, and found that there were very little clouds to be found. This was disappointing to say the least. I wasn't ready to call it a day just yet. I hunted around in an attempt to find some different compositions. One thing that I had found interesting the day before was the pier to the North of the hotel. The lighting had not been right on it with the cloud cover, but with the sun bathing everything in a warm morning light today, I found a much different character of the pier. 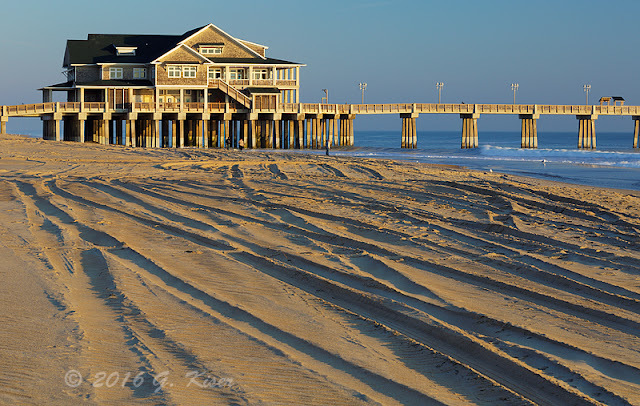 Sadly, there were no clouds behind it, but the tracks from various vehicles made some nice leading lines to the main building, and the pier itself provided a nice color balance through the water. While not exactly an amazing picture, I do like the overall feel of this image. With the sun rising ever faster in the sky, I had to work quickly because in no time at all, the sun would be too harsh to be able to do much with. I worked some more with the fences, but never really found much of interest. I did notice that there were a few light clouds moving into the area, and I worked quickly to find a composition to fit below the clouds. The problem was, they were so faint that I wasn't sure I would be able to get them. My mind went into monochrome mode, and I started shooting some frames thinking about using color filters in the conversion to add a little contrast to the sky. I wasn't sure if it would work or not, but I gave it a try. As it turned out, my idea worked out relatively well. I found the missing definition in the sky with the red filter, and was able to get a couple of pretty interesting monochrome images to finish out the day. I had now shot 117 frames over two days. I wasn't sure exactly what I had, or if any of them would be usable. I had to fight with conditions that were far from what I was hoping for, or planning for. Fortunately though, I still have enough tricks up my sleeve to work alternative plans on the fly. I would have liked to have shot a lot more, but considering the weather, this was a very successful Trek to the coast! I've had some feelers out for quite some time trying to get some new areas to photograph in my catalog. One lead that I have gotten recently was to head out to Julian, NC where there was a lot of rural landscapes and farm lands. I was excited to give it a try, but wasn't exactly sure what I was going to need in terms of weather. I decided to pick a day where we were looking at about 45% cloud cover for the day, which should have given me some nice blue to work with along with some clouds for contrast, and for diffusing of light on the landscape. Right up until Toni and I left the house, the forecast was looking promising, but the actual conditions at the house were far from ideal. We decided to plow on anyway, hoping that the conditions would get better as we got closer to Julian. My first stop was an old farm house located on Old Julian Rd which looked to be very promising in some scouting pictures I had seen. As I got there, I could tell that I wasn't going to be able to include the sky because it was a total of wash of gray. It would have been a great waterfall day, but that wasn't what I was trying to photograph. I decided that the house was too good to pass up, and I tried to work some intimate compositions where the sky would not be included. 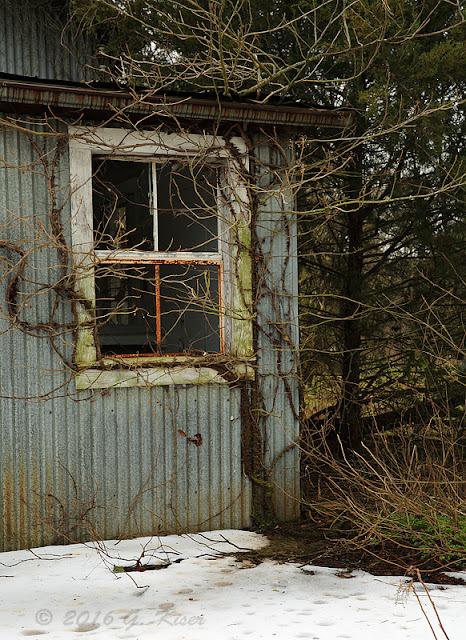 I found this one area on the back of the house which highlighted several different angles, and repeating patterns. The greenery at the corner of the house made for a very nice visual anchor as well. This was going to be my only workable composition on this house. I worked on fine tuning the image from both camera position and focal length. Once I was happy with the resulting image, it was time for Toni and I to start exploring to see what there was to see. We saw a lot of great old houses and barns on the roads in and around Julian. I tried to make some mental notes as we drove around, but pretty much, everywhere you look, there is a potential subject. The only problem was the sky, which was just not changing at all. 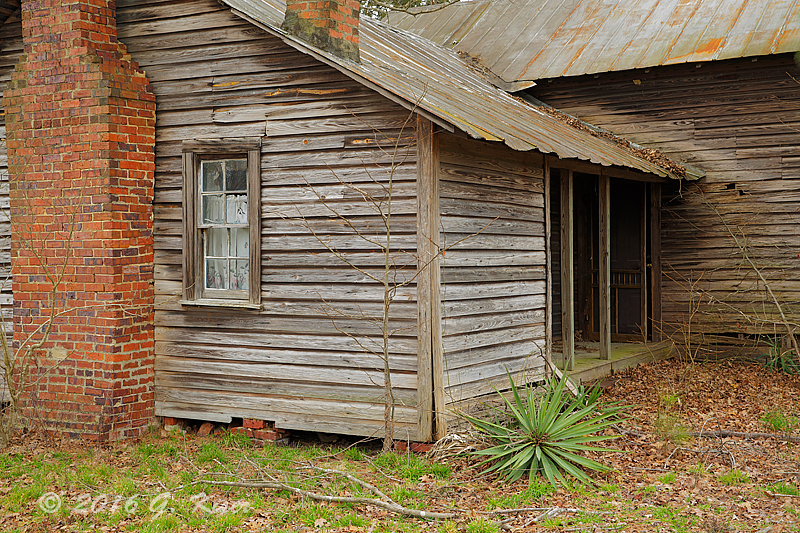 After a while of driving, we came upon what looked to be a vacant house, with a few barns to the rear. 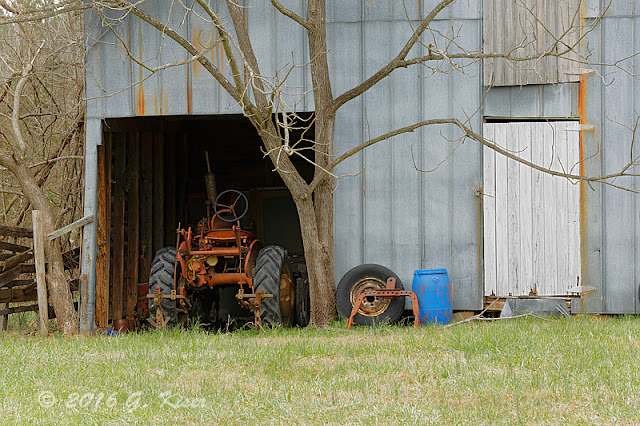 In front of one of the barns was an old tractor that caught my attention. I decided to give it a try despite the sky, hoping that I would be able to compose some images to avoid the sky as I had with the old house. Before I got out to shoot the tractor, I decided it was best to check with the next door neighbor to see if he knew anything about the property. He seemed nice enough, but did not know much about the owners other than they were not present in the area. After I explained what I was wanting to do, he decided that I should be OK taking some pictures. We chatted for a moment and I went to the truck and grabbed my gear to get started. The compositions became much harder than I had anticipated. I ended up including the sky in more frames than I wanted to, but there was just no way around it. I was happy that I was shooting with my 70-200mm lens though, as it didn't include near as much of the sky as a wider lens would have. I decided after a few minutes to try some intimate shots of the tractor, using only a portion of the barn in the background. 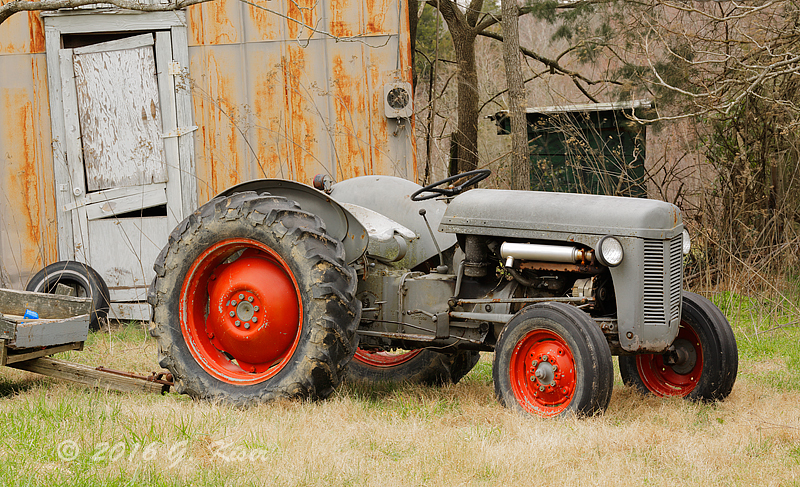 Just like with the house before, the intimate, tight shot worked out the best for the old tractor. Had it not been for the red wheels, I would have passed this one by since there was limited rust, and it even look recently used. 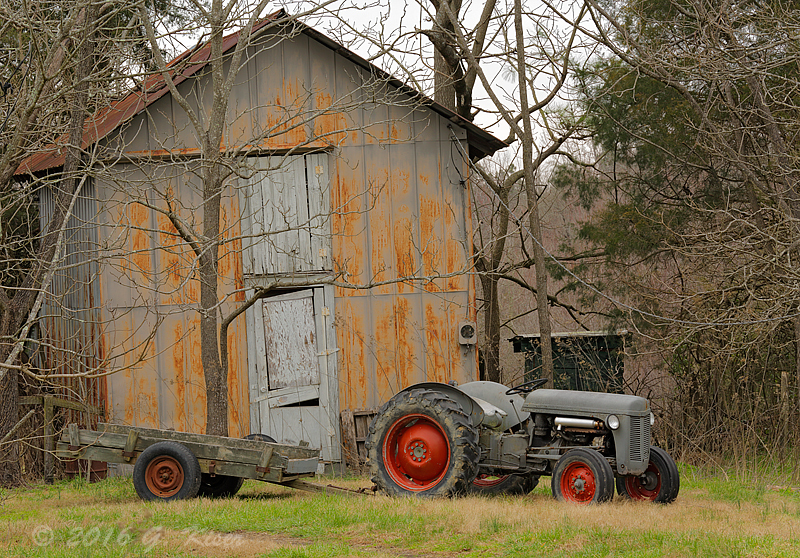 However, the red wheels against the gray primer really linked this tractor to the rusty tin barn behind it. That combination struck a chord with me, and I decided that I liked the concept behind this shot. Before packing my things up, I decided to try a long shot of a composition. There was a really nice tractor sitting inside of the barn. Knowing that it was deep in the shadows, and the barn face was a middle tone, and the door to the right was white, I knew that a proper exposure would be difficult at best. I made some very careful calculations as I was setting the exposure and really worked on maintaining detail in the white door and in the shadowed portion of the barn. 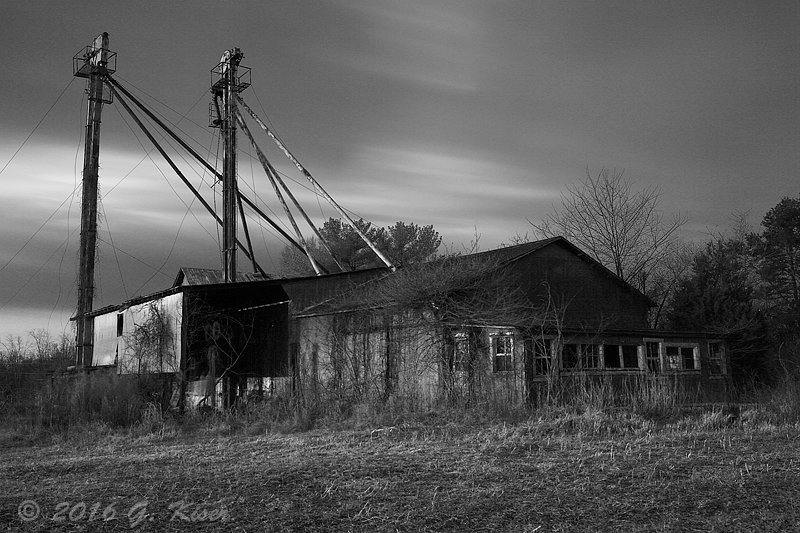 Based on the histogram after I shot the frame, I had captured all of the detail from light to dark. I just love the resolving capability of this 5DIII I've been shooting with for a couple of years now. It never ceases to amaze me! When I was done shooting, I was putting the gear back in the truck and the neighbor came back out and spoke to me once again. He had an idea for a photo project that he wanted me to take part in. I won't go into detail about it just yet, but it includes capturing farm life as it was in the 50's. This fascinates me to no end, as the project will include the barns, the tractors, and the techniques that were done back then. It will give me an up close and personal experience that I have always wanted to express in my photography, but have never really had that opportunity. When Spring gets here, we will probably be getting things rolling with the project. I hope to have a whole series of really cool images from this project to share, and maybe even put on display in the gallery here. I had been watching the weather for several days before this morning hit. There were going to be clouds over Yadkinville, and they were going to be low clouds. That normally means lots of texture in the sky. It also happened that I was going into work late, so I had time to drive out there to give the old feed mill another try. I keep seeing it from the highway every time I drive down US 421, and it has always captured my attention. With the large booms, the composition kind of makes itself, but it leaves a lot of open area that can only be filled with the sky. This means that the sky I choose to photograph under is the most important part of this particular image. I have tried a lot of different skies, but I haven't quite found the one that I like the best. This morning was promising to be pretty good! I woke up early and headed out to the mill in time to photograph the blue hour just in case the clouds would cooperate with me prior to sunrise. I wasn't sure exactly what would unfold before me, but I wanted to make sure I didn't miss anything since I would be working on a rather tight schedule in order to make it to work on time. I got there about an hour before sunrise, and got my camera built. I found my first spot to shoot from and fired off a test exposure at 30 seconds. It wasn't quite there, so I went ahead and switched to Bulb mode, and tried a few exposures in the 90 and 120 second range. These were working pretty well, but the clouds were much thicker than I had anticipated. While I was getting some definition in the clouds, the long shutter speed blurred most of it. This one exposure actually showed some promise with the swash of light blue against the deeper blue. The faint reflection of the sun reflecting off of the clouds to the left added just the right amount of complementary color to the sky. Even the textures were working out pretty well. It wasn't until I got home and did a monochrome conversion that I found the real personality of this image. It almost became sinister in appearance, and I liked it! As the sun came up, I realized that I was going to be hard pressed to get the shot that I was after. 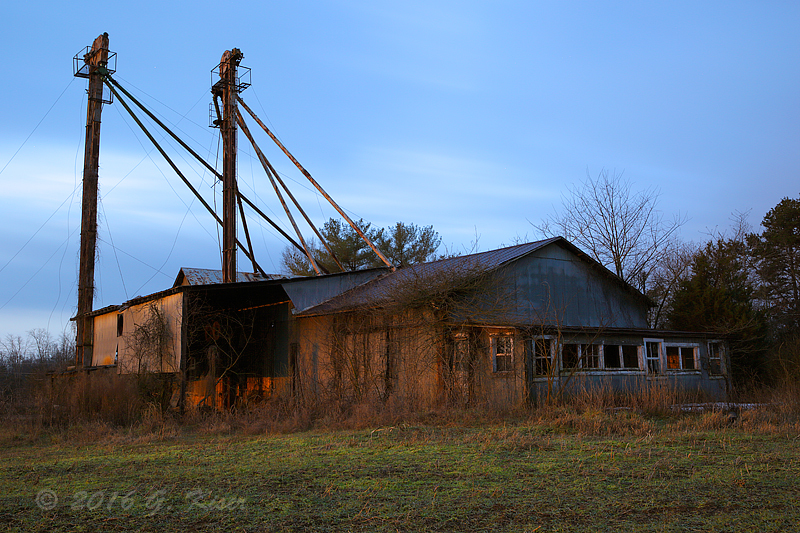 Instead of giving up, I decided to pick out intimate details on the old mill and photograph them instead. I started along the front of the building where all of the windows were. 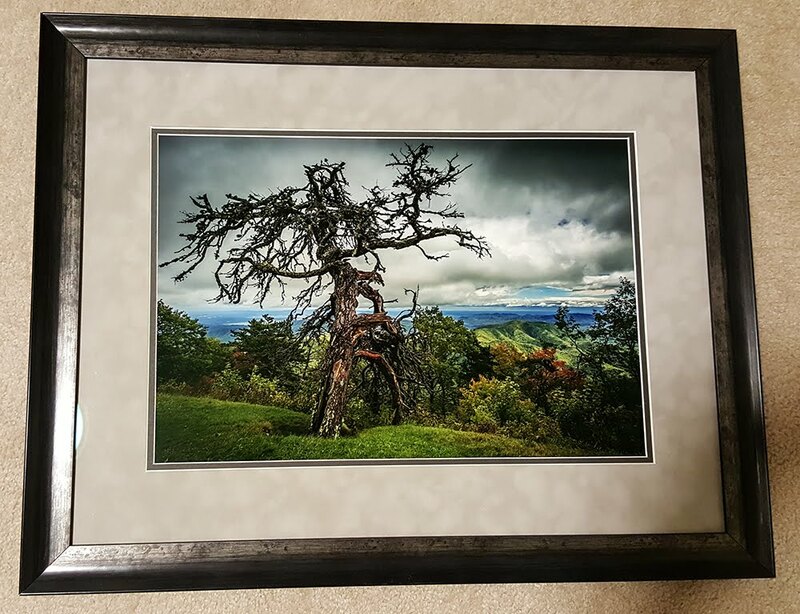 It took a little work, but I finally came upon a composition that I liked, so I got it framed up and shot the picture. This had a lot of things working for it. First of all, there was the snow at teh base of the window. This matched nicely with the white in the window frame. The tin siding is not normally my favorite thing to photograph, so I was very fortunate to have a tree right next to the window, and some errant branches moving into the frame. This gave me the texture of wood that I love so much in these images. The color of the trees also helped to balance out the siding and overall neutral tones. I continued around the building looking for some other subjects to photograph. I came upon the loading area and found a lot of little odds and ends to play with. There was a lot going on in here, so I decided to look at things as a graphical design more than anything else. That was when I started to be able to frame up some different compositions that otherwise would have made no sense. Of these, this one was my favorite. The colors work very well together, and I liked the fact that the wooden planks work nicely as leading lines into the image. 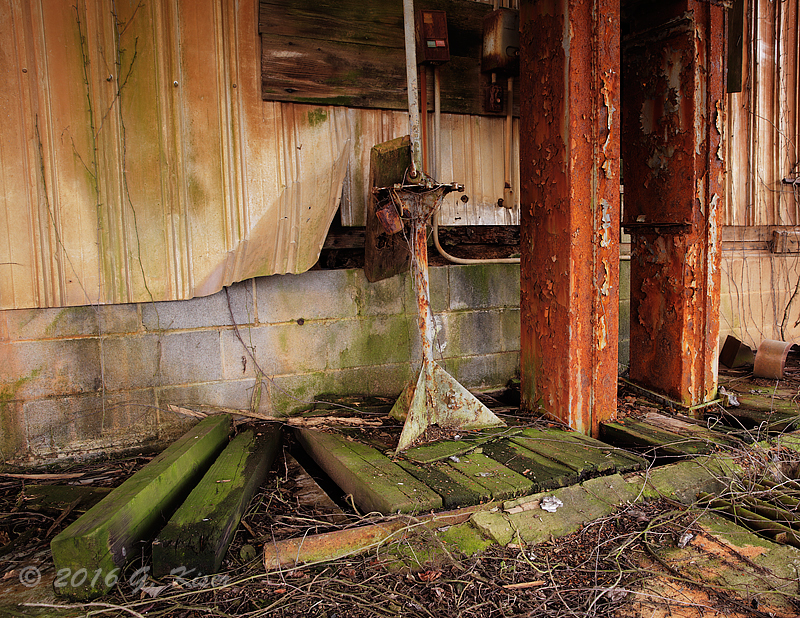 The rust gives a wonderful texture that compliments the textures of the wood and tin. The vines encroaching all over give a sense of time passing and lack of use. This image really does exemplify the "Rustic" theme for me. While working on these little details, I happened to see that the clouds were starting to break up a little bit. There was a tree at the corner of the lot that I had been working on with little success that I thought would benefit from the current lighting. 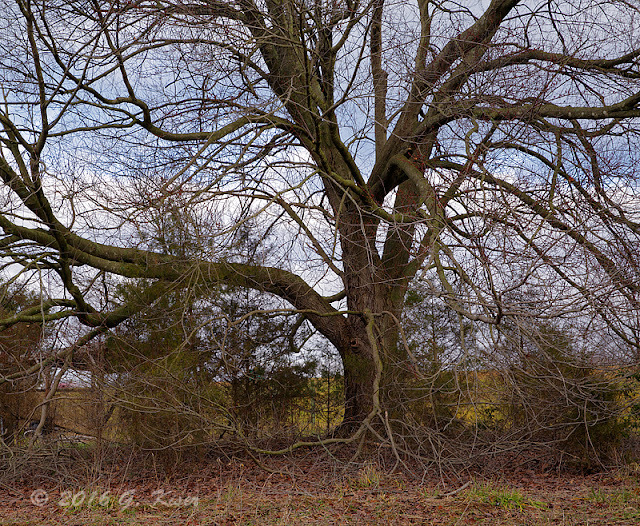 I grabbed my gear and went out to the tree and started to set up some of the compositions I had worked out previously. The branches of the tree were so haphazard that I couldn't help but be drawn into it. The band of blue sky in the background helped to break up the expanse of white in the clouds. The morning light was still very warm and diffused. The exposure was simple, it was the composition that was difficult. I had to avoid a power pole, minimize a shelter, and time the shot so as not to include traffic on the highway to the rear. That was a lot to consider, but the picture came out as I had visualized despite all of the potential pitfalls. When I was going through the pictures, Toni saw the tree and told me that I had to name it "Story". I'm not sure why she came up with that, but since I did shoot the tree primarily because of her little voice in my head, I decided to honor her wish. This picture is all her! The morning came to a close much sooner than I had wanted, but it was time to head to work. I was happy that I had the chance to get out and do a little shooting this morning, and look forward to other chances like this on days I go in late.